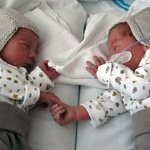 Learn what the probability is of carrying twins to term and what's considered full term for twins. Find out when doctors recommend that twins are delivered. What’s considered full term for twins? 40+0 weeks are considered full term for twins and singletons. However, if you give birth within three weeks prior to this – when you’re 38 weeks pregnant or 37+0 weeks pregnant – your children are considered born at term. This means that they aren’t considered premature and they’re expected to be delivered without any complications related to prematurity. Will I give birth prematurely? About half of women pregnant with twins give birth at term. This means that they give birth when they’re at least 37+0 weeks pregnant. The other half gives birth prematurely. Whether you give birth at term depend very much on your health, the course of your pregnancy, how your babies are doing, chorionicity and amnionicity. Chorionicity relates to the number of placentas. Amnionicity refers to the number of amniotic sacs (or membranes). It has to do with your twins being either dichorionic-diamniotic twins (di-di), monochorionic-diamniotic twins (mo-di) or monochorionic monoamniotic (mo-mo) twins. Di-di twins have individual placentas and a separate inner and outer membrane. Because they’re separated, the risk of pregnancy related complications are lower. The babies can’t develop Twin-to-Twin Transfusion Syndrome, Twin Reversed Arterial Perfusion or be at risk of umbilical cord entanglement and compression. Di-di twins have the greatest chance of being born at term compared to mo-di and mo-mo twins. Fraternal twins are always di-di twins. About one third of identical twins are di-di twins. Mo-di twins share a placenta and the outer membrane, but each have their own separate inner membrane. As a result of sharing a single placenta, the blood supplies can become connected, so that the twins share blood circulation. The blood can be transferred disproportionately from one twin to the other. This is called Twin to Twin Transfusion Syndrome (TTTS) and happens to about 10-15 percent of monochorionic twins. It’s life threatening in the most severe cases, but treatment is often successful. 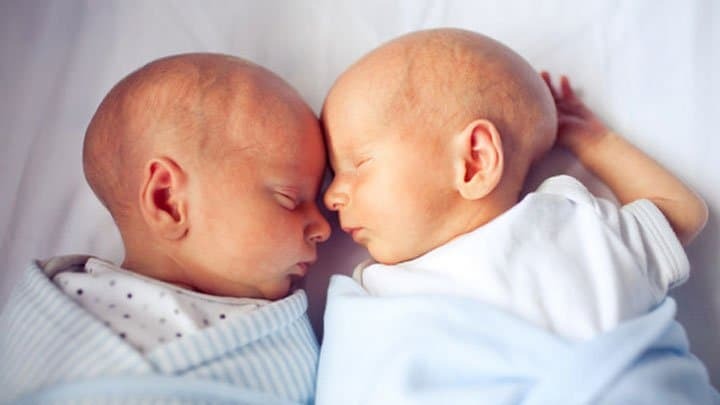 Mo-di twins can only be identical – be aware though that, in rare cases, placentas can fuse together fooling health care providers into believing that fraternal twins are identical. Mo-mo twins share a placenta and both the outer and inner membrane. The risk of complications is very high. This is because the babies are in the same sac. That makes them at risk of umbilical cord entanglement and compression during pregnancy and birth. All mo-mo twins are identical twins and are very rare. About 1 percent of identical twins are mo-mo twins. Is reaching full term for twins possible? Reaching full term for twins is possible, but not likely. Many doctors recommend that you get a caesarean section or induction at least 2-4 weeks prior to you being full term with twins. This is because the risk of stillbirth and other complications increases slightly in the weeks leading up to your due date. Doctor’s don’t necessarily agree about the timing of delivery. In monochorionic twin pregnancies recommendations start from 34 weeks up to 38 weeks. * In dichorionic twin pregnancies it’s from 37 weeks up to 39 weeks. *This goes for uncomplicated monochorionic pregnancies. If you are carrying mo-mo twins most doctors will recommend that you get a caesarean section around week 32-33. A recent study from 2016 decided to examine the optimal gestational age for delivery of twins. The researchers looked at 32 studies of women with uncomplicated twin pregnancies that reported rates of stillbirth and neonatal mortality at various gestational ages after 34 weeks. Overall the studies included 35,171 twin pregnancies. The researchers found that in uncomplicated dichorionic twin pregnancies, delivery should be considered at 37 weeks’ gestation – this is when you’re 37+0 weeks pregnant. In monochorionic pregnancies delivery should be considered at 36 weeks’ gestation. In monochorionic twin pregnancies, they didn’t find any clear evidence to support routine delivery before 36 weeks’ gestation. Win free stuff for twins by participating in our contests. Find the companies that offer coupons, discounts or freebies for multiples. Find out where to buy the best twin pregnancy journal book. Have a look at classic, vintage & animal themed twin pregnancy journals.